TreoCentral user TechDude, and many other members of the forum recently encouraged Softick to create a Treo 600 compatible version of their Card Export II application. With a little work, Softick released today Beta 4 of Card Export II, bringing with it Treo 600 support. Card Export II is an application that emulates the USB Mass Storage standard. This means that the Treo can be plugged into any modern computer, and without any driver installation, act just like a normal USB thumbdrive. Then, it can transfer files from the SD card in the Treo to the computer, and from the computer to the SD card. 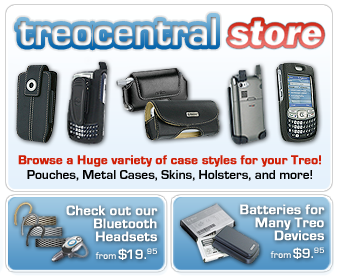 This is an incredible step for the Treo. Using this application, one can quickly transfer images, MP3s and video files without a hotsync. Or copy new applications over just by dragging the PRC to the drive in Windows Explorer, or a Mac's Finder. Or even use the Treo as a modern floppy drive, shuttling PC files between computers without having to carry anything but a sync cable. I tested it out before writing, because frankly I did not believe the claims. After installing, and pressing "connect to desktop" while the USB cable was plugged in, I was able to drag a WAV file that SoundRec generated right onto my PowerBook and play it. No hotsync, no other installaions, just a simple, quick file transfer. This is incredibly cool stuff. Card Export II is available now in beta form for $14.95. A free trial is also available. I hope to write a full review of Card Export II soon, but I strongly recommend that all Treo 600 users take a look at this application, as it is so simple, yet it creates a very powerful new feature.